Oh captain, my captain, my captain, my captain, my captain. 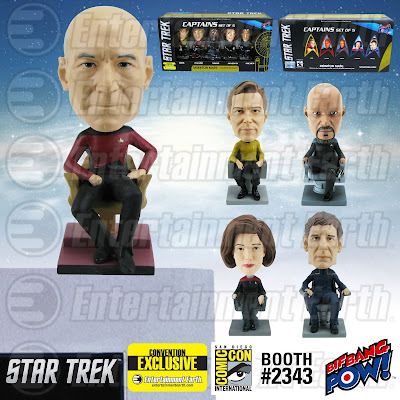 Five captains are better than one with this incredible Star Trek: The Captains Monitor Mate Bobble Heads Set of 5 - Convention Exclusive made exclusively by Bif Bang Pow! as an Entertainment Earth convention exclusive! Now collectors can use their monitor to proudly display all five of Starfleets most prominent commanding officers. Included in this convention exclusive are, Captain James T. Kirk of Star Trek: The Original Series, Captain Jean-Luc Picard of Star Trek: The Next Generation, Captain Benjamin Sisko of Star Trek: Deep Space Nine, Captain Kathryn Janeway of Star Trek: Voyager, and, Captain Jonathan Archer of Star Trek: Enterprise. Each 4-inch scale miniature resin bobble head figure showcases a captain with their ship specific captain's chair that can attach to a computer monitor or flat surface via a non-damaging adhesive pad on the base. Set your monitor to stunning with this individually numbered and limited edition of 1,000 pieces. Not attending San Diego Comic-Con 2015? *PRE-ORDER your Star Trek: The Captains Monitor Mate Bobble Heads Set of 5 - Convention Exclusive at Entertainment Earth now! Other Entertainment Earth exclusives include a Saturday Night Live Weekend Update Amy Poehler/Tina Fey 3 1/2-Inch Action Figures Set of 2, Star Trek IV Whales with Spock Bobble Head, the KISS Alive II Stage with 1:20 Scale Action Figures - Deluxe Box Set #1, and more. More than 25 Entertainment Earth convention exclusives will be announced until San Diego Comic-Con. Visit Entertainment Earth and all of our social media networks for the latest Entertainment Earth and San Diego Comic-Con news.